The printing of finished parts is a very popular way of increasing the visual aesthetics of a product part for relatively low cost. At AKI pad printing is carried out on one, two and three-colour pad printers and five-colour CNC printing machines. All machines are microprocessor controlled; so all parts are printed to the highest standards, and each colour that's printed uses a separate pad so the printing can be built up gradually for a perfect print. Pad printing is a cost effective way to print parts, yet it's also a highly reliable process and can produce parts to a high standard. The most crucial part of the pad printing process is the plate on which the graphic is etched - called the cliche. The etching of graphics onto this plate is very important, as it determines the quality of the final graphics once printed onto the component. Once this cliché is placed in its fitting in the machine the 'cup', which contains the ink for the printing, is positioned on top. This ensures that while the pad is printing the component, the cup will distribute ink into the etch on the cliché. As the arm controlling the pad slides back, the ink cup moves with it and slides away from the etch. This means that only the ink on the plate will be retained in the etch and so can be picked up by the pad. The pad is then lowered onto the designed graphic, formed by the etching, and picks up the ink that is transferred to the next part. This is the printing process. The pad is made from silicon as this means it can pick up the inked pattern without the ink permanently becoming attached to it. The hardness of the pad will depend on the texture of the surface that is to be printed. For example for a rough surface, more pressure will be required to apply the ink on the surface, so a harder pad is required. The opposite is true for surfaces which have a smooth finish. The consistency of the ink is also very important. Printing using a state of the art CNC machine ensures that graphics are printed to the highest possible standard. Six pads, using five colours, are programmed using the touch panel interface so the sequence of printing can be optimised. CNC pad printing also means that each part that's being printed is lined up using lasers to ensure that it's in exactly the right position under the pads. This ensures that even when the machine is loaded with a number of mouldings at a time, each one will be printed to the same standard - reducing production time and keeping costs to a minimum. 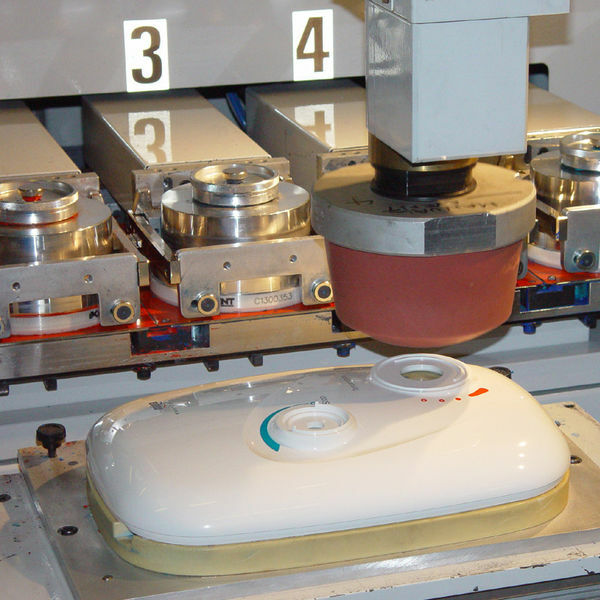 CNC pad printing also benefits from having a 3-axis servo motor driven robot-printing arm. This means that it's possible to print very large parts or even parts that have an uneven surface. Since injection moulded parts are rarely perfectly flat this is a major benefit as it means any graphic can be printed onto the surface of the mouldings with little difficulty. As pad printing machines are controlled by microprocessor, the level of 'repeatability' is high, particularly when using CNC printing. This means that each part will be printed exactly the same and all to a high level of accuracy. Even with CNC controlled machines, pad printing is relatively easy to learn and maintain. There are few parts to change so jobs can be swapped between quickly. CNC machines are easy to set up once programming has been written. The use of lasers helps to line up jigs so that parts can be set up in the correct place quickly. 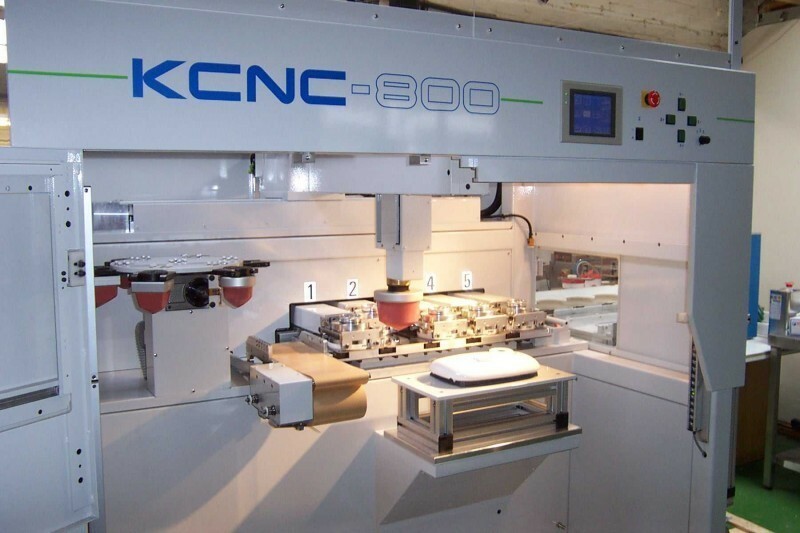 To change the pad and cliché is a fairly quick process for both CNC controlled and manual printing machines. Assuming that the correct ink is chosen, pad printing can be carried out on almost any material. So long as the ink is designed to stick to the surface of that material, pad printers can be used. At AKI we're particularly good at printing on to chrome plated mouldings. The pads of pad printing machines can be designed to be almost any shape. On curved surfaces, for example, a flatter pad can be used to ensure print goes right around the surface. This helps to give designers greater freedom when designing graphics. Pad printing has the ability to print many colours without the need for intermediate drying time between each. This helps to greatly decrease the time needed to print multi-coloured parts as there isn’t the need to allow each colour to dry separately.